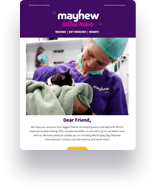 Mayhew is a small animal welfare charity with a big difference. We know that a major part of our work lies in understanding the links between social issues and animal welfare, and we work hard to improve life for pets and their owners through a series of pro-active community initiatives and preventative veterinary care. One of our most important beliefs is that neutering is the most responsible action an owner can take for their pet. When Rosie and Brave’s original owner passed away, they were left with no home – and no-one to look after them. A neighbour cared for the two cats as best as they could, until sadly it became too overwhelming for them to continue – and Rosie and Brave turned to life on the streets. Being unneutered, Rosie was at risk of multiple pregnancies, infections and even death. Her litters would also have increased the number of stray and feral cats in the community. Luckily for both cats, they were recently found by our Animal Welfare Officers and brought into Mayhew for treatment. Both were then quickly rehomed, and now live happily without the risk of unwanted litters. Our vision is for all pet owners to recognise the benefits of neutering. To make it as easy as possible for those in a vulnerable situation to access our services, we offer an innovative Pick & Snip programme designed to provide free neutering to those most in need. Our Pick & Snip service is available for dogs and cats, within our designated catchment area. Unneutered female cats are able to reproduce from just five months old, and can have up to three litters per year. This could understandably cause problems for owners who are not able to look after a large and ever-growing number of pets – and could sadly lead to cases of animals been abandoned, neglected or traded irresponsibly. By preventing unwanted pregnancies and other behavioural, health and welfare issues, we hope to see fewer animals abandoned or brought into our shelter, and more pets stay together with loving owners. Poor little River was found abandoned in a commercial garage, which we suspect she had chosen for warmth. Her beautiful white fur was stained with oil, and more upsettingly, she had recently given birth – but her kittens were nowhere to be seen. River was friendly and curious when our Animal Welfare Officers arrived on the scene, leading them to believe she was a domesticated cat. They also discovered early signs of mastitis, a bacterial infection which effects milk production and is prone to developing in dirty environments (like a garage). Because River was found without her kittens, we sadly have no way of knowing if they have survived – or were abandoned elsewhere, or even sold on for profit. Many other cats unfortunately suffer in identical situations, and we believe widespread neutering would prevent unwanted mums and kittens alike meeting similar fates. River has now been neutered and is in good health. She is being well looked after by staff at Mayhew whilst she waits to find her forever family. To find out more about the benefits of neutering, and to see if you are eligible for our Pick & Snip programme, please visit our website here – or alternatively call and speak to one of our Animal Welfare team on 020 8962 8000. To adopt River, or see our other animals needing a new home, please check out our rehoming pages here.